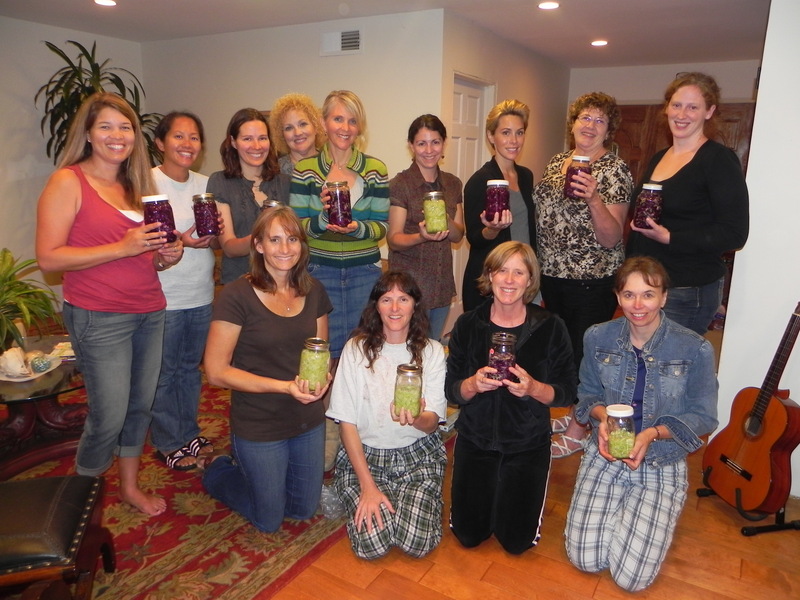 I had the fun opportunity to host a Fermentation 101 class for a group of moms here in Santa Barbara and it was a ball! I started by posting to my homeschool email list serve to see if anyone was open to doing a monthly fermented food swap (like one I had done in DC), but almost all who responded were curious about fermenting foods, yet wanted to learn more before they started swapping their creations. So my hospitable friend, Jenna, opened up her home to 15 of us and we learned, tasted, and made sauerkraut and orange marmalade together. Following are the notes, recipes and pictures of our little Fermentation Festival! 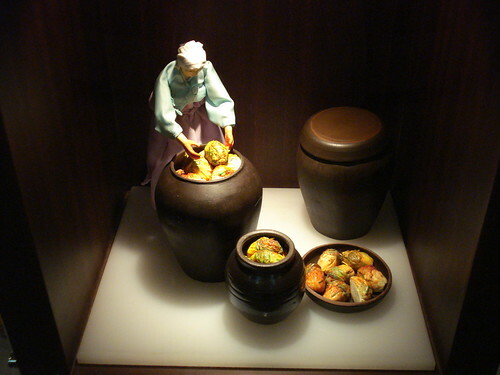 History – Traditional cultures around the world have been fermenting food as a preservation technique for as far as we can tell. You can probably think of examples even now: Germany’s sauerkraut, Russia’s kefir, Greece’s yogurt, Korea’s Kimchi, etc. In fact, the first yogurts and cheeses were accidentally discovered when animal milks were stored in animal bags and curdled during the treks through the hot desert of North Africa. Health – Probiotics, a gaggle of beneficial bacteria, has recently become known mainstream to promote healthy digestion, a more effective immune system, healing, detox, and an increase in vitamins and antioxidants. The goal should eventually be to eat something fermented at every meal to help with digestion and repopulate the gut. 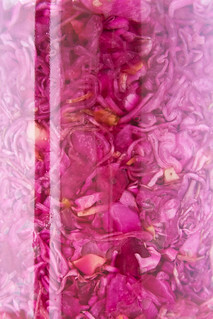 You can even drink the brine of fermented veggies as a health tonic. process produces lactobacillus bacteria which feed on sugar and produce lactic acid (giving the final product that typically fermented “sour taste”). Art – But for those of us whose eyes glaze over at the fermented factoids, the good news about cultured foods is that it can be quite the art form. The variety and options are endless (pink sauerkraut? apple and strawberry kefir soda? blueberry chutney? ), you can use all sorts of spices, herbs, fruits, etc. to flavor your final product, and you can taste as you go and stop at your liking. If something flops (and it will) you can just feed it to your compost bin and it will go back into your garden to grow a new batch of veggies for future creative culturing experiments! Bubbies Pickles – You can pick these bad boys up at most health food stores and you will find them in the refrigerated section because those that are on the shelves have been pasteurized (which kills all the good bacteria.) These beauties are expensive however, so I like to buy them every once in a while and re-use the brine to ferment other veggies like radish slices, cucumber slices, or dilly beans. Sauerkraut – I brought my homemade kraut for them to taste which just involves shredded cabbage and salt (recipe below). But sometimes I add shredded apples, or make a cortido (Latin American kraut) by adding carrot, onion, and oregano. We use this on sandwiches, in tuna salad, or even as a side dish when I’m low on other veggies. Ketchup – Instead of fermenting ketchup from scratch, I simply add a tablespoon of whey to my store bought organic ketchup. All condiments were originally fermented and you can find recipes for anyone of these: mustard, mayo, relish, chutneys, salsa, horseradish, garlic, hot sauce, guacamole, salad dressings. As well, you can be a culturing cheater and just add whey to what you already have in the frig. The downside to this is that you are only getting the 4 or 5 strains of probiotic bacteria from your yogurt whey, so fermenting from scratch (or from kefir whey which has far more bacteria) is even better. Orange Marmalade – I made this for the first time (directions below) and though it is not as sweet or as thick as the canned variety, it is still fresh and flavorful. I’m experimenting with adding chia seeds to thicken it and you can always add honey to your final product. The good news is, any fruit can be fermented – apple butter, blueberry chutney, cranberry chutney (I will post my recipe before Thanksgiving), and, of course, add whey to store bought jams and jellies. Cheese – If you see “cultured milk” on the ingredient list of your favorite cheese then it is fermented. Just make sure that it is cultured after pasteurization. Raw milk is best, and I have found a few inexpensive varieties at Trader Joes. Other cultured dairy options are: kefir (35+ strains of bacteria), crème fresh, some butters and cream cheeses (again, read the ingredients). The one most well-known in our culture is yogurt, but if it contains added sugars then you are defeating the purpose of eating beneficial bacteria. Sugar feeds the bad guys, so stick with organic, plain, and whole fat and add your own fresh fruit. If you want to learn how to make yogurt at home, Katie at Kitchen Stewardship has a great step by step process. Sourdough Bread – Making bread is a home art that has existed for centuries, but modern bread making has taken the rich and diverse sourdough starter culture and turned it into a packet of mono-cropped, engineered, nutrition-starved yeast. Read here for the distinct differences between the two. Unlike store bought, yeasted bread, you need very few ingredients for home sourdough: flour, water, salt, plus a sourdough culture. Buy a starter culture online, get one from a friend, or make your own! You can also find a few good brands of real sourdough bread at the store, but make sure they only show these ingredients: flour, salt, water, and a starter culture. MAKE – We learned to make 3 things that will be great jump starts to a life of fermentation! Whey – This is an easy culture starter. Pour a quart of organic, plain, whole yogurt (we love the Strauss brand) in a tightly woven kitchen towel, close it with a rubberband, and let it drain into a bowl overnight. Put the liquid (whey) from the bowl into a pint jar and store in the frig for fermenting. Use the yogurt cheese in the towel as a spread or dip. Mix with honey and cinnamon, various fruits, or salt, garlic and herbs. Easy peasy! Orange Marmalade – Zest four oranges and put the zest in a mixing bowl. Cut all the pith and peels off of the oranges and cut the fruit into bite size pieces – add to bowl. Mix in 1/8 cup (2 T) whey, ¼ cup sugar (Rapadura or Sucanat are best), and ½ T sea salt. Mix together well and put in a pint size jar with a lid. Cover with water if necessary and leave to ferment at room temperature for about 3 days. (I’m experimenting with adding chia seeds to try to thicken it.) Taste, refrigerate and enjoy! http://www.culturesforhealth.com/ – A go-to resource for fermented food recipes, culturing supplies, and starter cultures to order. 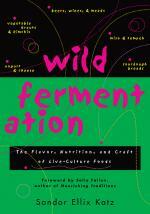 http://www.wildfermentation.com/ – From the book of the same name, Sandor Katz has been fermenting since 1993. He has recipes, workshop dates, and his cookbooks for purchase. http://nourishedkitchen.com/ferments-cultured-food/ – This website is great for all traditional foods, but she has a wonderfully detailed page on fermented foods including history, health benefits, and recipes. http://users.sa.chariot.net.au/~dna/kefirpage.html#obtaining-kefir-grains – this odd little website was started by Dom the undisputed King of Kefir. Everything (and more) than you wanted to know about kefir including how to get the grains. www.Youtube.com – If you are a visual learner, search You Tube for videos of people fermenting all kinds of recipes. http://www.pickl-it.com/ – And if you get tired of consistent fermentation failures, these somewhat expensive, but helpful products are a worthy investment. They hold the veggies under the brine with an airlock system creating foolproof, successful fermenting. Alright, so which fermented food/drink do you feel inspired to make? This entry was posted in Build Good Health, Eat Real Food, Learn New Stuff by Shesourceful. Bookmark the permalink. Wow Mel. This is going right on my pinterest. I so appreciate your less-frequent, more-informative style of blogging! Love those pickle jars at the end… I might spring for a couple when I have more space. So question for you. I was at Leah C’s house the other day and she served pepper jelly over goat cheese, which was extremely yummy. Any thoughts about making a fermented version of the pepper jelly? Also, are you avoiding pectin on purpose in your marmalade? Why? Here’s a recipe for a fermented pepper sauce from one of my favorite blogs: http://www.sustainableeats.com/tag/fermented-hot-sauce/ Perhaps that’s along the lines of what you’d like? I only avoided pectin because I didn’t have any. I’ve heard whispers of trying to incorporate pectin, chia seeds, or even gelatin to thicken ferments, but no concrete evidence yet. I also think pectin and gelatin have to be combined with a heated liquid in order to incorporate it, no? If you did that first it would have to cool down before adding it to the ferment or you’ll kill the beneficial bacteria. Post here again if you try something that works! Thanks, Em! I did a little more digging and found that Wardeh has a post for making Fermented Raspberry Jelly! She says strawberries are too acidic so I wonder about using this method for your marmalade, but it’s worth a shot! These recipes look really intriguing! I do have a somewhat of a silly question, so please excuse my ignorance. When sugar is fermented, what is the alcohol content (if any) of the resulting dish? The word “ferment” just gives sets off a red flag in my mind. Good (not silly) question about the alcohol content of fermented foods. In a couple of the fermented foods described above (namely kombucha) there is a minor alcohol content (from .5 – 3% depending on how long you let it ferment. According to this analysis (http://www.happyherbalist.com/analysis_of_kombucha.htm), 8 days between 74-84 degrees is ideal for the lower alcohol content while still maintaining a more pleasant taste. http://bodyecology.com/articles/is_wine_good_for_you_or_not.php#.UHrBCY5P5SV – And this reputable source shares the difference between alcohol ferments and healthy ferments. If someone does have a sensitivity to alcohol, it may be best to try them slowly and avoid ferments with sugar. Adding extra pectin would help create the jelly texture. A high pectin ingredient can be made from apples.